Drink Coca-Cola Delicious and Refreshing Serving tray measuring 13 1/4" x 10 1/2" x 1". Printed on the tray is The Coca-Cola Co 1940 The Armerican Art Works Inc Coshocton Ohio Made in USA. 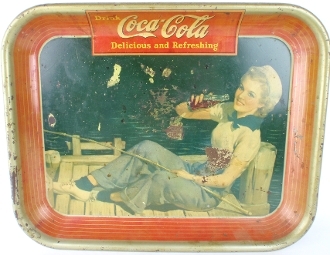 Tray features "Sailor Girl" relaxing on pier, leisurely fishing while enjoying a delicious and refreshing Coca-Cola. No telling how many Coca-Cola's this tray delivered to a thirsty customer. Tray does show a lot of wear, some rubbed thru areas and edge wear.